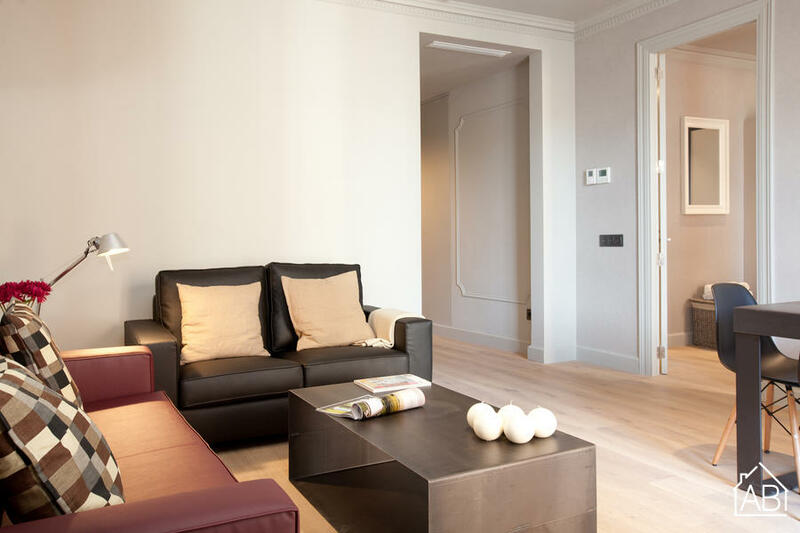 This stylish, designer apartment is located in the centre of Barcelona, very close to a number of Barcelona’s most popular areas including Plaça Catalunya and Plaça Espanya. Located in the Eixample neighbourhood, you will find countless bars, cafés and restaurants in the area as well as supermarkets for your convenience. Also located nearby you will find Barcelona’s famous shopping street Passeig de Gràcia, and Las Ramblas. This luxurious apartment has 3 bedrooms and can comfortably sleep up to 6 people. Complete with a cosy living room and its own private terrace, this apartment is the perfect place to kick back and relax after a long day! The modern, fully equipped kitchen also provides the perfect place to prepare your favourite, home-cooked meals. You will also find a coffee maker, a dishwasher and a washing machine in this state-of-the-art apartment. The apartment building itself has been recently renovated, has security cameras, and has an experienced 24 hour concierge service to take care of all your needs. Complete with air conditioning and heating, this apartment is the ideal Barcelona home at any time of the year.